The Art of Spiritual Healing is based on Joel Goldsmith's many years of experience in practicing spiritual healing. 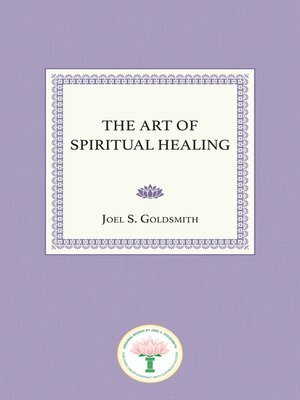 In a decided departure from other books on the subject, Goldsmith reveals the spiritual principles that are the foundation for spiritual healing. He alternates instruction with meditation to demonstrate his conviction that since physical health is a manifestation of consciousness, physical well-being is a natural result of attaining the consciousness of oneness with God. Complete in scope and non-denominational in approach, The Art of Spiritual Healing is a simple, straightforward explanation of what to many is a mysterious and complex subject. The book is presented in four parts: "The Principles," "The Role of Treatment," "The Practice," and "Without Words or Thoughts." Goldsmith believes that the world needs people who, through devotion to God, are so filled with the Spirit that they can be the instruments through which healings take place. He says, "There is not a person reading this book, who should not be ready to accept the responsibility of beginning to heal now. It is not your spirituality or mine that will heal anybody; it is not your understanding or mine that is going to heal. It is God's understanding to which we make ourselves receptive by becoming still."